I am a professor in the Earth and Planetary Sciences Department at McGill University and a Canada Research Chair in the Geodynamics of Ice Sheet - Sea Level Interactions. I did my PhD at Harvard University in Earth and Planetary Sciences, and post doctoral work at the Courant Institute of Mathematical Science at NYU. I work at the intersection between solid Earth geophysics and climate science. My research centers around the interactions between ice sheets, sea level and the solid Earth, and the response of these systems to past, present and future climate changes. I am also a member of the McGill Space Institute. titled "Solid Earth Change and Evolution of the Antarctic Ice Sheet". I will be teaching EPSC 510 - Geodynamics, an upper level undergraduate class covering data and modeling of a range of different geophysical processes. I gave a talk on "Ice sheets and sea level in a changing climate" at McGill's Soup and Science event - short lunchtime talks and networking giving undergraduate students a change to hear about research happening at McGill, chat with professors, and find out how to get involved. Dave Purnell and Erik Chan's research was featured in the McGill Space Institute's 2017-2018 annual report. Check out page 12 for a look at the work Dave and I have been doing in collaboration with David Holland at New York University, and page 19 for Erik Chan's work on "The Fluid Case of Ancient Mars". Linda Pan presented her research on sea level and tide projections as an NSERC summer undergraduate researcher at McGill's undergraduate research conference. Our paper “Estimating Modern Elevations of Pliocene Shorelines Using a Coupled Ice Sheet‐Earth‐Sea Level Model” by David Pollard and I, Rob DeConto and Holly Han is now out in the Journal of Geophysical Research. I spent 2 weeks in Finse, Norway as a lecturer at an international Advanced Climate Dynamics Course (ACDC) on Hemispheric Asymmetry in Climate. Holly Han attended the course as a student as well and we both left inspired and motivated. Check out the video that one of the students, Danielle Lemmon, made about the experience. I took a vacation in Mont Tremblant, Quebec with my wonderful partner filled with biking, hiking, swimming, meditating, cooking, yoga and plenty of rest! Breaks are so important - I returned to work energized with a clear head and fresh perspective. Erik Chan, a post doc with me at the McGill Space Institute lead a paper with Taylor Perron, Jerry Mitrovica and I exploring the possibility of an ancient ocean on Mars. The paper is in press in the Journal of Geophysical Research - Planets. Holly Han received the J.B. Lynch Fellowship and Dave Purnell received the LeRoy Memorial Fellowship. These fellowships are awarded to outstanding graduate students in the Earth and Planetary Sciences Department at McGill University. PhD student Dave Purnell and I traveled to Greenland to install instruments in Disko Bay to measure sea level change and ice loss of the Jakobshavn Glacier, the fastest flowing glacier on record. MSc student Anna Hayden and I attended the Polar2018 meeting in Davos, Switzerland, where I gave a talk and she presented her work on sea level and ocean tide changes in the Hudson Bay complex in Northern Canada. The final version of my paper on the influence of lateral variations in Earth structure on past ice sheet evolution in Antarctica with Konstantin Latychev (Harvard) and David Pollard (Penn State) is now out in the Journal of Climate and available here. Masters student Anna Mireilla Hayden was awarded an NSERC Postdoctoral fellowship - Congratulations Anna! Anna is working on exploring the influence of sea level change on ocean tides in the Hudson Bay complex in Northern Canada and will be presenting her research at Polar2018 in Davos, Switzerland this June. Holly Han and I had a productive and inspiring visit to the Geosciences Department at the University of Massachusetts Amherst, where I gave a department seminar, we heard about the exciting climate research of students and faculty in the Geosciences Department and we met with David Pollard (Penn State), Rob DeConto and his group to discuss our research on climate, ice sheets, sea level and the solid Earth. PhD student David Purnell passed his qualifying exam - congratulations Dave! Dave works on observations of sea level fingerprints and ice mass loss. Holly Han and my paper titled "The impact of water loading on postglacial decay times in Hudson Bay" on glacial isostatic adjustment following deglaciation of the Laurentide Ice Sheet in North America came out in Earth and Planetary Sciences Letters. It is available here. My paper on the influence of lateral variations in Earth structure on past ice sheet evolution in Antarctica with Konstantin Latychev (Harvard) and David Pollard (Penn State) was accepted for publication in the Journal of Climate.​ An early online release of the manuscript, unformatted, is available here. I gave the 2018 C. Gordon Winder Memorial SCUGOG Public Lecture and visiting the Department of Earth Sciences at Western University in London, Ontario on February 1st-2nd. I traveled to Washington DC to participate in an expert elicitation on the contributions of ice sheets to future sea level change run by Resources for the Future, Rutgers University and Princeton University. Wilmes, S.B., Green, J.A.M., Gomez, N., Rippeth, T.P., and Lau, H.. (2017). 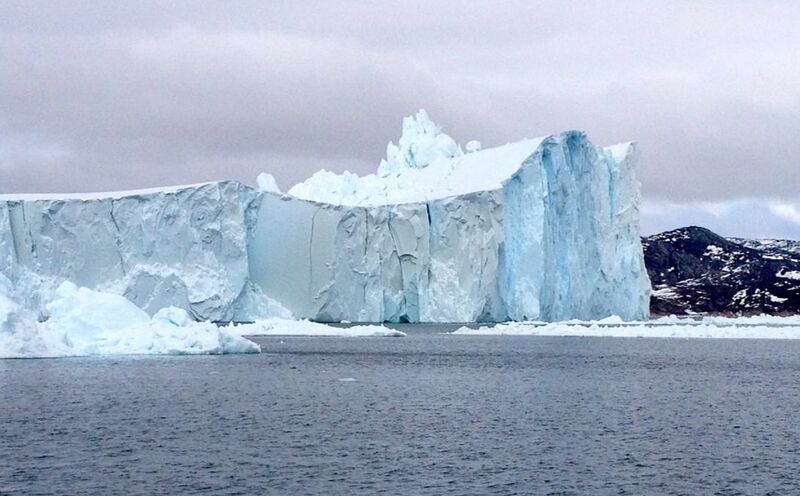 Global tidal impacts of large-scale ice-sheet collapses. J.
I will be attending the AGU fall meeting in New Orleans, USA, and giving a presentation on "Interaction of ice sheets, sea level and GIA in a region of complex Earth structure" in a session G008. I gave seminars at the Department of Earth and Environmental Sciences at Ottawa University and in the Department of Earth and Planetary Sciences at Washington University in St. Louis. I attended the PALSEA2 5th workshop: Phasing of ice sheet and sea-level responses to past climate change in Playa del Carmen, Mexico. Undergrad student Katarina Kuhnert won second place in her category at the McGill Undergraduate Research Conference for her poster on Arctic Sea Level Change and Policy. She will also present at the Ouranos Climate Symposium in November. I convened a session on Glacial isostatic adjustment on a heterogeneous Earth at the International Association of Geodesy's 1st Circular Workshop on Glacial Isostatic Adjustment and Elastic Deformation in Reykjavik, Iceland. I chaired a session on Paleo sea level data and GIA modelling and gave an invited talk on Insights from coupled modeling on ice, sea level, and solid Earth changes in Antarctica at the International WCRP and IOC conference on Regional Sea Level Change and Coastal Impacts in New York City, New York, USA. PhD student Holly Han attended the POLENET Glacial Seismology Training School in Fort Collins, Colorado, USA. The Gomez group went to dinner to celebrate a great year! Three students graduated, Jake completed his undergraduate Honours thesis, Anna is beginning an MsC in the group, and we have two additional summer students, Gabriel and Katarina. I was the Faculty Feature in McGill University's sustainability publication The Sandbox, discussing climate science and the implications of climate change for society.